Before seeing Dr.Watson debugger Effects and Fixing from how to get rid of it, what actually happened when I tend to start this post? right then my pc hanged down, letting me to think, Oh God what a pity is this? Perhaps a coincidence but makes me suspect how..! 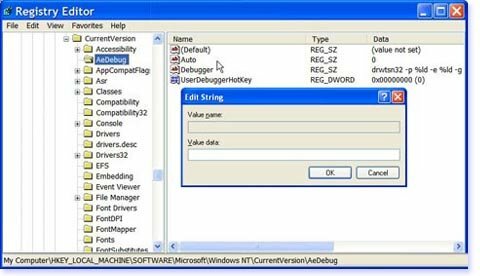 Dr.Watson is an application debugger included with the Microsoft Windows operating system. It is usually named drwatson.exe, drwtsn32.exe or dwwin.exe depending on the version of Windows. Dr.Watson error is one amongst the many errors cornering the pc of your’s, many experienced it; Dr.Watson type of debugger is seen often with XP version of windows this type of error occurs when another kind of program is being downloaded. Installations of the software are looked into by the registry. When a program error occurs in Windows, the system searches for a program error handler which deals with errors as they arise during the running of a program, if the system does not find a program error handler, the system verifies that the program is not currently being debugged and considers the error to be unhandled. The system then processes unhandled errors by looking in the registry for a program error debugger for which Dr.Watson is the default. How to clean and remove it to save your registry of the Pc? 1.Click Start>Run>type Regedit and click ok.
4.Close registry editor, restart your computer.